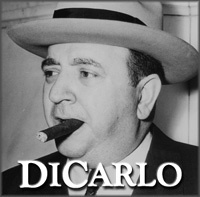 DiCarlo: Buffalo's First Family of Crime is now available in hardcover, trade paperback and e-book formats. (Separate e-book formats are available for Amazon Kindle devices and Apple iBooks/B&N Nook devices.) Links to the book detail pages of popular U.S.-based retailers are shown in the table below. Click cover for a high-res image of dust jacket. * A Kindle device is not needed to read Amazon Kindle-format e-books. Free Kindle readers are available for computers, tablets and smartphones through Amazon.com. ** A Nook or iPad device is not needed to read EPUB-format e-books. Free Adobe Digital Editions software is available for a wide variety of computers and devices. Company names and logos and e-reader device names are trademarks / registered trademarks of their respective companies. They are used here solely to link with products offered by those companies.